DERU formerly knows as Schlicht is a puzzle game that brings two players together in a cooperative teamplay experience, in which they solve abstract and complex levels. With teamwork, timing and tactical placement both players bring color into the world of DERU. The game is developed by Ink Kit who are part of the collective Mr. Whale’s Game Service. During Gamescom 2017, the developers of Deru were there showcasing their game to the public. 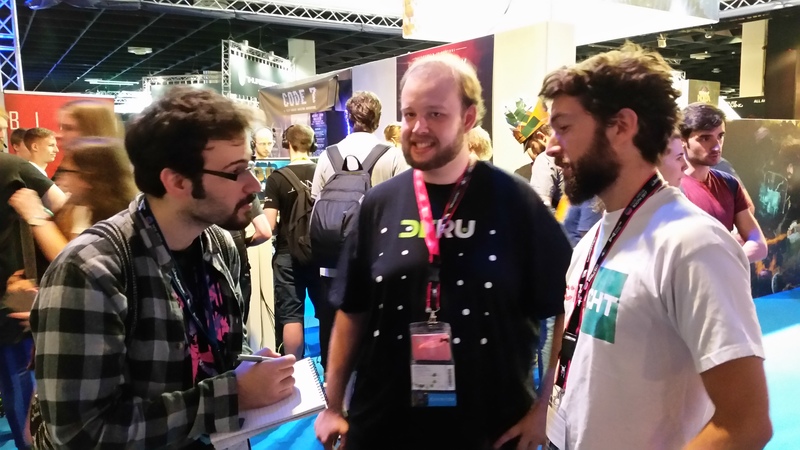 We found them at the Indie Arena Booth and had a chance to talk with them about their game and their plans for it. We met up with Dominik and Christian, who are two of the four people involved in the development of Deru. We of course interviewed Chris last year during Gamescom 2016, so we were very curious to see how far the game has come development-wise in a year. The game’s concept came out of a game jam that happened back in 2014 with the main idea for it being that the developers wanted players to “not see things as they are. We wanted to make something small but cool.” They explained that they eventually came up with a mechanic for their game while discussing about what they should make but there wasn’t any other specific concept behind it at the time. “The plan is at the moment to release the game near the beginning of 2018,” the devs explained. There is no set date at the moment for the release but we were told that it is most definitely “coming.” We were also told that the studio is very focused on finishing the development of Deru because they really “want to make it happen.” There is also a plan to port the game to consoles and the overall focus of development has been the co-op experience that the game provides. The developers also said that they will not be doing online multiplayer since something like that may need a big player base and that is hard for an indie to find. The studio already has a devkit for porting the game to Switch and Xbox One and they are also in the talks for a PlayStation 4 port. For more info on Deru, take a look at the game’s Website, Twitter and Facebook.